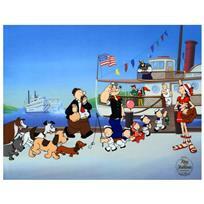 "Homerun Popeye - Reds" Limited Edition Sericel from King Features Syndicate, Inc., Numbered with COA. "Homerun Popeye - Reds" is a limited edition sericel with background from King Features Syndicate, Inc, numbered and bearing King Features' official seal. Includes Certificate of Authenticity! Measures approx. 13" x 17" (cel). "Betty on Deck - Orioles" Limited Edition Sericel from King Features Syndicate, Inc., Numbered with COA. "Tallstacks" Limited Edition Sericel from King Features Syndicate, Inc., with COA. 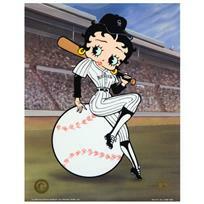 "Betty on Deck - Marlins" Limited Edition Sericel from King Features Syndicate, Inc., Numbered with COA. 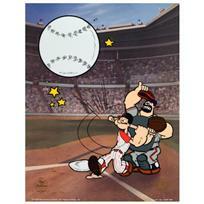 "Betty on Deck - Rockies" Limited Edition Sericel from King Features Syndicate, Inc., Numbered with COA. "Betty on Deck - Reds" Limited Edition Sericel from King Features Syndicate, Inc., Numbered with COA. 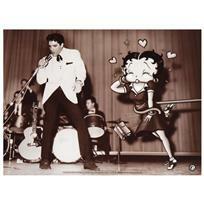 "Starstruck Betty (with Elvis)" Limited Edition Lithograph from King Features Syndicate, Inc., Numbered with COA.